Paisley Cemetery Company Limited became a member of the Federation of British Cremation Authorities in 1938, with the provision of a new, purpose built crematorium, designed by the well-known local architect James Steel Maitland. One of the finest buildings of its kind anywhere in the country; it was opened on 28th October 1938 by the Rt, Hon. Lord Salveson, and is today a well-preserved listed building. The crematorium serves not only the Paisley and Renfrewshire areas, but also North Ayrshire, West Glasgow and beyond. 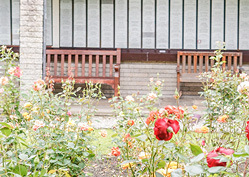 The Woodside Crematorium features one chapel, a public waiting room with toilets, and drinks machine, together with a room displaying our Books of Remembrance, and memorial plaques and an open- air flower court in which to view floral tributes following a funeral service. The Woodside Crematorium Chapel can accommodate up to 84 people seated and 20 standing, with the Remembrance Room providing additional space for up to 80 people standing. The chapel is non-denominational and is designed to facilitate funeral services of all faiths and of none. Certain Christian symbols are present, but those that are removable will be removed on request. The services are at hourly intervals and start on the hour. The first service is at 9.00am and the last at 4.00pm. On a Saturday morning the last service is at 11.00am. The service itself should finish at least 20 minutes prior to the following service, to allow sufficient time for mourners to leave the chapel and for the staff to prepare for the next funeral. At Woodside we recognise that music is an extremely important part of the funeral service. To help provide the most choice and ease of access we have installed a professional Music System called the Wesley Media System which can provide almost any commercially available piece of music. Wesley Media will normally be able to get a requested piece of music added to our library with 72 hours’ notice (providing it is commercially available). We have an organ available and can provide an organist should you wish, please note an additional fee will be incurred for the engagement of the organist. To view the music library listings please click here, and for pieces not already within those listings – please make the requirement for these known to your Funeral Director as soon as possible so that an order can be placed. (To view the music already held within the system at Woodside please feel free to click here. Unfortunately, it is not always possible for friends and relatives to attend a funeral. For such instances a live viewing of the service can be made available via the Internet which can be viewed by those invited with the appropriate username and password. The webcast is also available for up to seven days after the service. Please book this through the Crematorium at least 48 hours in advance so a username and password can be issued. Your Funeral Director can organise this for you. Ashes are scattered in one of the Gardens of Remembrance. If you wish to be present when the ashes are being scattered, you must inform the Funeral Director when you are making the funeral arrangements as an appointment needs to be made. There is no fee for scattering ashes if the cremation took place at Woodside Crematorium. If the cremation took place elsewhere a small fee will be charged. Please call the office on 0141 889 2260 to make an appointment. No personal items may be placed in the Gardens of Remembrance. If desired, a floral tribute of fresh-cut flowers may be placed in the vases provided in the gardens. The staff will remove flowers once they have died. 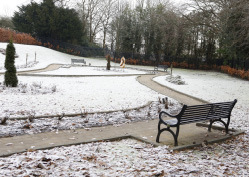 The Old Garden, New Garden and the recently opened Woodland Garden offer peaceful settings for contemplation, all three are adjacent to the Crematorium and open every day of the year. Please note: The Woodland Garden is situated at the bottom of a flight of stairs and may not be suitable for people with reduced mobility. The Old Garden is immediately adjacent to the crematorium and is the original Garden of Remembrance. The Garden is open every day of the year and contains the open-air flower court where the floral tributes are placed daily following each cremation service. There are several rose beds where fresh cut flowers can be placed and there are also a number benches should you wish to sit in quiet reflection. The New Garden can be found as you make your way past the Crematorium on the left-hand side situated behind a black iron gate. This walled Garden was created in the early 1970’s and is the most visited garden at Woodside. Here you will find the Cloisters which house the very popular Cloister Memorial Plaques there are also memorial benches in the Cloisters should you wish to sit and spend some time in peaceful contemplation. Fresh cut flowers can be placed in the Garden and there are vases provided for your convenience. This Garden was opened in Autumn 2016 and can be accessed via a stairway in the New Garden. This Woodland setting is a tranquil place for you to spend some time thinking of your loved ones. Fresh cut flowers can be placed in one of the many rose beds and there are benches should you wish to rest in this calming area. Here you will also find a Memorial Sculpture dedicated to Baby and Infant Loss. 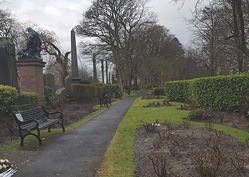 Paisley Cemetery Company commissioned local sculptor Robert Coia to design and create a fitting memorial and the sculpture was installed in November 2017. Official Organisations for Cremation and Burial in the U.K.